Your wedding day is just the beginning. 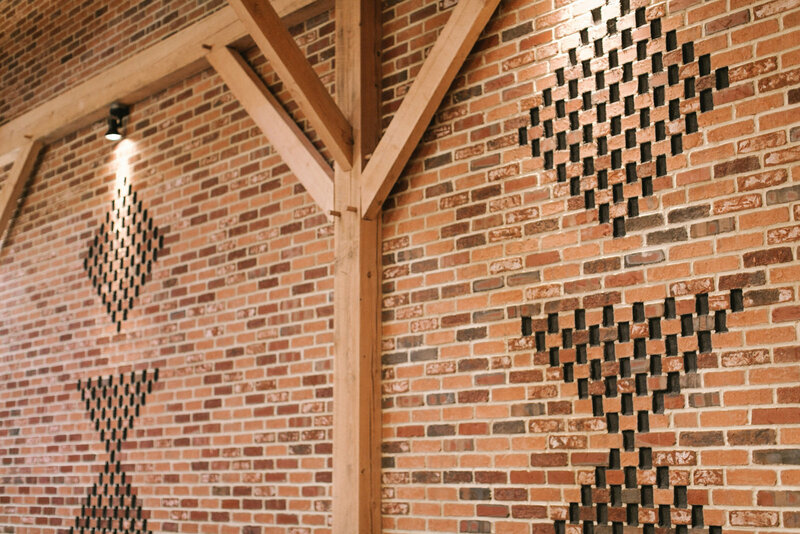 Celebrate with your loved ones surrounded by exposed wood rafters, beautiful brickwork, and high beam ceilings in our classic barn venue. Customize each space to be uniquely yours with décor and lighting—and see your wedding day vision come to life! Can I bring/hire my own caterer? No, we have an exclusive caterer at Brick Gables. Country Home Catering is our in-house caterer. We require that you follow all parameters stated in our alcohol policy. Yes, if you are interested in seeing our preferred vendor list, email us at info@brickgables.com and we will send it to you. These are suggested vendors who are familiar with Brick Gables. Yes, we just ask that the candles are contained in a proper enclosure. Where can we go to take pictures? Adjacent to Brick Gables is a nature trail perfect for lush, outdoor photographs. Our stone and brick exteriors also provide a rustic backdrop for individual or group photographs. Or if you prefer a farmland setting, many options are available within a easy 5 minute drive in any direction. Our town of Lititz offers a ton of unique picture options. For example, Lititz Moravian Church is a beautiful backdrop for pictures taken in their front lawn. Across the street from the church is the Lititz Museum where the gorgeous Mary Oehme Gardens will create stunning images. Finally the brick walls of the famous Wilbur Chocolate Factory and the old railroad tracks allow for a distinctive setting for a couple’s pictures.